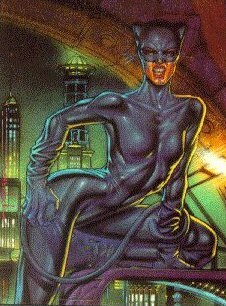 While Batman, my favorite Comic book character, has a number of Web Pages dedicated to him, there are few resources dedicated to Catwoman, by far his most interesting nemesis. Certain Batman sources discuss Catwoman in passing and I do have links related to Catwoman alone below, however I wished (with the urging of my young daughter) to create a central resource for others who enjoy Catwoman's appearances in the Batman titles and of course her own Comic. I favor Catwoman among the villains for the same reason I favor Batman. Just as Bruce Wayne is neither a mutant or in the strictest terms a super hero, so Selina Kyle is essentially 'normal'; a thief and former prostitute (not getting into Crisis controversies here..) she chose to become Catwoman expressing a deeply felt part of herself (and yes I realize these are fictional characters), and her costume reflects this self expression. Further she is a strong and independent, very self assured. I much prefer my daughter pretending to be Catwoman around the house (Mag is 5 and her knowledge of Catwoman is from the movie and the cartoon series- the comics are a bit too violent for her yet...) pretending to fight Batman rather than play some Victim who needs to be rescued by him. Perhaps villain is the wrong word... anti-hero is better, someone who is out for her own interests, not seeking to control those of others but yet will put them aside for some greater reason (e.g., the recent Contagion series). So for my daughter and for other Catwoman readers such as myself I have created these pages. please feel free to mail me with any suggestions, comments and resources. Please note this page concentrates mostly on the comics though there are a resource or two from the movie and cartoon. Selina Kyle began her criminal career on the streets, as a prostitute. She came from a broken home, yet her sister Maggie chose to make of herself something quite different, becoming a nun. Selina and her sister are still not close in the comics, though Selina did later save her sister from her former pinp the small time hood, Stan. The turning point for Selina seems to have come after being arrested as a young woman. The cop could have leaned on her with some heavy speeches but instead gave her the name Ted Grant as a man who could help her watch out for herself on the streets. Grant, a former boxer, taught Selina self defense. During this time she also learned how to handle a whip. Selina always loved cats, so it was natural for her to make a costume patterned after her beloved animals after being inspired by the news of a new crime fighter in Gotham City, the Batman. Selina stopped hooking, selling herself to be used by others and became a professional thief, standing on her own and often against the one who inspired her to become a cat- Batman. Please note: All characters from DC Comics, are trademarks of DC Comics. Catwoman is Copyright 1996 by DC Comics. Please support them- they write the best mainstream comics around.